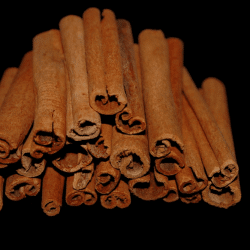 Cinnamomum cassia is differentiated from “true” cinnamon. Although similar, it comes from the bark of a different species. Though if you’re in the United States, you might never know the difference. There, cassia is often sold as cinnamon. Cassia is prized by distillers however. The bark is thicker, and although some describe the flavor as being “less delicate” than true cinnamon, the thicker, hardier bark is better suited to distillation. Cassia itself in gin imparts an aroma that is easily recognizable to most as being cinnamon-like. In stores, Cassia can often be recognized in stick form for it’s thick, single layer sticks. Often very stiff, they are also hard to grind. Cinnamon has thinner layers and is easy to break and grind.